Weebly is one of the most popular online tools that help people create websites, without them having to know HTML, CSS, or PHP. The prevalent opinion is that this is a very easy and fun tool to use. This in-depth Weebly review is here to reveal both strong and weak sides of this website builder. The builder at Weebly has a drag and drop, WYSIWYG interface (“What You See is What You Get” ). This means you have modules (photos, videos, text, comment sections, etc) and you can drag them onto the web page directly. Where you place them is where they are going to be displayed when visitors start coming to your website. This is an intuitive tool used by most site building tools today. UPDATE: We’ve updated this review (2nd of January 2019) to reflect recent changes and additions to the Weebly platform. We’ve reviewed a few websites but none of them made it possible for you to add other people as “editors”. Basically, you give privileges to people who you trust and they edit your website. This is a feature which is useful when you’re building a portfolio with someone else, a business website, or an eCommerce web store. Changes you make appear immediately and there’s no need for you to constantly save your progress and refresh your browser. Progress is saved automatically every time you make any type of change to the website. Also, you have a free mobile version editor, where you see how your website would look on a mobile device and make changes to that. Lots of other services like Weebly require a premium subscription for a mobile version, but here – it’s free. The eCommerce platform is not only very easy to use and configure, but it’s also very powerful! A rare combination indeed, but it makes the life of people who don’t want to spend hundreds of dollars on web designers much easier. In the settings panel there are lots of options that help you configure your online store and get it up and running. There are also features which are available only to paid users, like PayPal checkout, shipping cost calculator, and tax calculator. Our recommendation is to test out the eCommerce system and then decide whether it’s good. If you find it as powerful as we do, upgrading is going to make your life easier. Don’t worry, there’s nothing wrong with the themes and how they look. But only a small number of them look like they were made by professionals who did it with passion. You can easily describe a large part of the themes as minimalistic. Although this is one of the main fashion trends at the moment, it’s not the only one. One plus is that Weebly have enabled external designers to create themes that can be used on the website. That, however, is bonded with costs for buying the themes from the developers. There are free themes, but you can say that they are at the quality of the ones that come with Weebly. If you want to create a blog, you will start encountering some problems when you start growing your website. Weebly has no tools that easily allow you to manage large masses of content. Once you reach hundreds of posts and you have thousands of visitors each month, you are going to find it hard to manage all of your content. There are no basic features like “Most Popular” and “Related” posts which is a bit of a lay off. Also, you have a limit on the pages which you can create with the free plan. If you want to keep growing your blog, then you will have to upgrade to a paid plan. Even though it’s the most popular and easy to use payment method online, PayPal checkout is a paid feature. You will have to upgrade to another plan, different from the free one, if you want your online store to accept PayPal as a payment method. This is a small obstacle for people who are just trying to test things out before launching the online store. However, Weebly have taken their time to make the system very good. SEO optimization has become a very important part of the website creation process. This is why Weebly have made it possible for you to edit meta tags and titles. You also have the option of adding your own custom code at the header or the footer. That code can be anything – trackers, Google Analytics, or even HTML code. Unlike some other major website creation tools, like Webs for example, the SEO optimization module is free and there’s no need to subscribe to premium plans to use it. You get a basic visitor analytics, and with the custom code that can be imported you can also use Google Analytics or any other online tool that tracks traffic on your website. A useful feature which we haven’t seen in many other builders is the 301 redirects tool. It helps you easily set up redirects from pages that are no longer existing to pages which are acting as their substitutions. Or you can use the redirect to mask your affiliate links or just to shorten links to other websites for your convenience. NOTE: Looking for other, similar website builders? Take a look at our Wix review or Squarespace review right away. What makes Weebly a competitor for the top spots in the best online website creation tools is the fact that you can edit the HTML and CSS of the web pages. As we already mentioned in the cons section, you might feel that a good deal of the themes are not to par with the representatives from its competitors. Well, if you’re a savvy web designer, or if you intend on hiring one, then Weebly is the place to create your website on. Keep in mind that Weebly support is not going to be always able to help you once you start editing the code of your template. If you are having problems with the display of your theme and you can’t fix it, you will have to change to one of the themes from the options panel. In the editor, you are able to edit the current files of your themes, as well as add new files (HTML/CSS, photos). This is great if you want to keep everything organized and if you want to add new features to your website via code. Creating mobile-optimized versions of websites is usually connected with lots of coding. Thankfully, Weebly have added a mobile layout builder, which is free, which allows you to easily see and change how your website displays on mobile devices, such as phones and tablets. Mobile layouts include a swipe menu with your pages and social media buttons on it. On the mobile editor page, you can select a custom theme for your mobile-optimized website on the right, as well as some basic settings, such as colors and fonts. Weebly’s mobile builder is one of the easiest to use of its kind. One cool thing to notice is that there are two buttons at the bottom of the page which allow you to switch between iOS and Android preview. This is a great feature and we haven’t seen any other service like this provide it. With that single feature you ensure yourself that your website will display perfectly regardless of the device type. Weebly features a powerful set of built-in email marketing tools called Weebly Promote. Using the Promote feature, users can create and send email campaigns that use the same design language as their Weebly site. The feature works exactly like the Weebly site editor, offering users an identical drag and drop WYSIWYG system. Similar to leading email marketing software like MailChimp, Weebly Promote allows you and your site visitors to stay in touch through mass mailings and even personalized messages. The results can all be tracked internally with performance tracking variables like delivery rate, open rate, and click rate. Unlike other email marketing tools, Weebly Promote syncs automatically with your site and features professional VIP consultation. These are apps that work to increase website sales. They range from adding product testimonials to coupons and promotions. Apps in this category allow you to customize your site with sharing buttons and other social elements that increase interactivity. If marketing is not your thing, you can install various site boosters and SEO monitoring tools using the apps in this category. Part of what makes Weebly so usable is the straightforward way it allows users to design sites. Their suite of in-house apps enables users to take their site design skills to new heights with just a click of a button. Users can edit or even create a new Weebly sites using the mobile app. Offering the same themes and editing functionality as the desktop site, the app lets you choose and fine tune the fonts, colors, and interface that is right for your site. Real-time analytics and reporting enable you to keep an eye on your site at all times. If people aren’t reacting to changes in the way you expected, you can always change your site anytime and anywhere. With offline editing, you are able to update your site on the fly without need for an internet connection. Simply sync the work once you’re connected and enjoy the freedom of being able to work wherever you are. The Weebly app is no throwaway tool, either. As of our January 2019 Weebly review update, the iOS app has 4.5/5 stars and the Android app has 4.2/5 stars. As we already mentioned, Weebly does provide a platform which allows you to create an online store without too much hassle. Most of the basic features that you need to create an online store are free and they are very easy to use. Adding products to your website is pretty easy and you are allowed to have promotions. While for free users the number of allowed products is limited, if you upgrade to Business, you can add unlimited products. When you subscribe to that plan you also get a ton of useful features which both make your life easier and help you gain regular clients. One of the most useful features is the ability to create discount coupons for a fixed amount of money, or for a percent of the product cost. You can set which products or category of products is eligible for the discount – a popular practice is to either select product groups which are selling slowly or products which are popular (and you want to embrace people to buy them). When you add a product to the system, it automatically creates a new page for it. You can easily add variations of a product (different colors for T-Shirts for example), which will end up displaying small buttons or text fields where people can choose their variation before checking out. To our opinion, the product page looks professionally done with the ability to add several product images, and a short and long description panels. Just below the short descriptions are social media buttons. The eCommerce system accepts 3 different payment methods at the moment. One of them, expectedly, is PayPal, although that is a paid feature. The other two – Stipe and Authorize, not so popular, are also good checkout options. Update: As of October 2014, additional checkout providers are available. For further monetization of your website, there is an Adsense module. You have to connect your Adsense account to Weebly and it will begin displaying targeted ads on your website. Keep in mind that having Adsense ads on your online store is a not good idea as it can potentially drive away customers who click on the ads. Another free tool is the email tool. It saves predefined emails for purposes like order confirmation, refund, and email that confirms shipping. This is very useful for an online store which wants to gain its users’ trust. 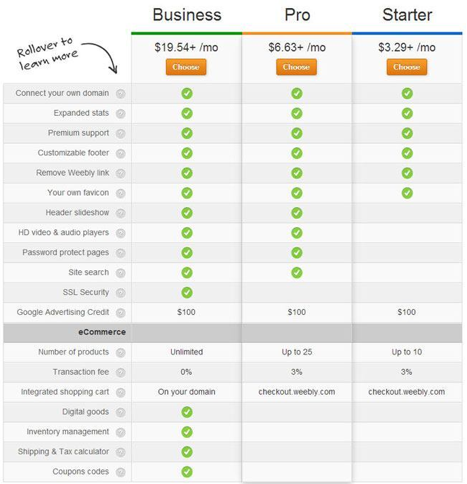 The price of the cheapest plan is very low – just above $3/mo for an yearly subscription. It provides you with the basics that you need to create your own website. It does lift most of the limitations that you have with the free plan and it doesn’t cost much. Even with this plan you get $100 advertising credit for Google. The second plan – Pro is just below $7/mo and it serves as a good upgrade to the most basic plan. It does unlock features like the HD video and audio player modules for the drag and drop builder and it also allows you to create password protected pages. Apart from that, you get to add more products, if you are building an online store. Another useful feature that this package unlocks is the site search. The third plan – Business is a large jump from the previous one – almost $20/mo. It is the third and last plan that Weebly are currently offering. If you have a website which is steadily growing, jumping from $7/mo to $20/mo might seem like an obstacle. After all, that’s three times what you were paying per month. However, if we look at the value that you are getting with the most expensive plan – it’s impressive. One of the most notable things is – you get SSL security on your website. This alone costs around $70/yr. SSL security is a great way to build trust in your visitors, and it allows online stores to checkout on the website itself (if you’re subscribed to the other two plans, the integrated shopping cart is on checkout.weebly.com). You also get to add unlimited products, and you can now sell digital products. Weebly usually charges 3% per transaction with the other 3 plans (including the Free one), but with the Business there is no fee! Advanced features are also unlocked: inventory management, shipping and tax calc, and coupons. Even though it is a significant jump between the second and the third plan, it is worth it. The falling of all restrictions does come at a significantly lower price than its competitors. Weebly indeed is one of the best services of its kind. It has one of the best builders and it offers a free mobile design editor. Even if you’re only a free user you get lots of features to build your website with. If you decide that you want to upgrade you have 3 options. People who want to create online stores most commonly pick the third and most expensive option. The other two are more than suitable for people who want to create online portfolios, blogs, or communities. The number of excellent themes on Weebly isn’t big, but a good relief is that you can edit the HTML/CSS code or you can get a template from an external designer. Even if you get the template from an external designer you will still be able to use the drag and drop builder. Weebly provides great support and are reachable even by other channels like social media – take a look at their Facebook and Twitter pages. We think that Weebly is great for eCommerce websites thanks to its powerful platform. Once you upgrade to the Pro plan everything is there for you – tax calculators, shipping costs, automatic emails, SSL protected website, and so on. Adding products is very easy and the inventory manager is powerful enough to help you maintain a website of this caliber. In conclusion we think that, overall, Weebly is a great tool and it can be used for a wide range of purposes. The design of the templates is not up to par with its competitors, but that can easily be fixed by editing the code or getting a website template. The price for subscription isn’t high and you get amazing value for it. SIDENOTE: Join the discussions below, or share this Weebly review with your friends using the social sharing buttons. When I came across Weebly, it was after being heartbroken by another CMS (Webeden). A friend of mine told me that their entire design team can log into Weebly as editors, which makes it a whole load easier to keep on top of design and development projects. I didn’t need this feature at first, but as my business expanded I definitely couldn’t live without it. Considering other CMSs literally force you to share log in details with anyone that you want to access your projects, Weebly let you create specific editor accounts which I much prefer, and it’s far more secure too. Andy, what other CMSs are you referring to? I use WP and they let me create temp or access accounts for anyone that I want to modify my designs and content. You can restrict what these guests can do too so I know for a fact that there are other platforms. I do use Weebly myself, and in many ways it is just as versatile as WordPress. The live development tools are pretty cool, especially if live site updates are your thing. Plus it is pretty easy to drag and drop to your heart’s content.